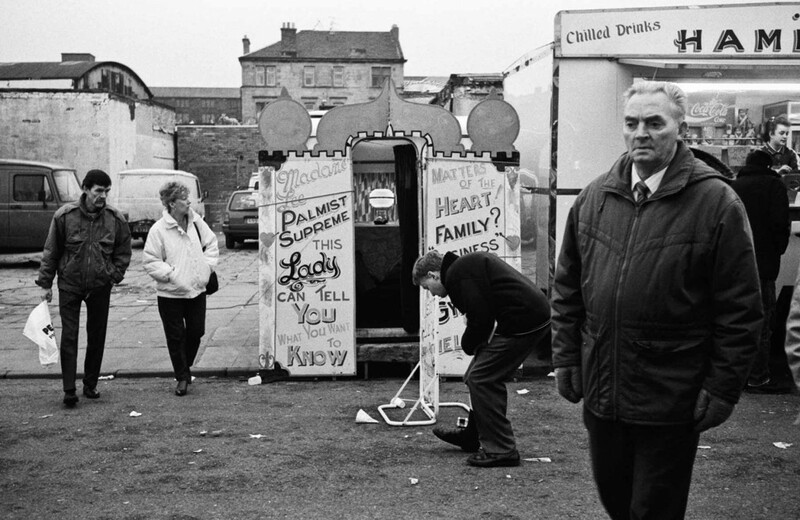 We have now launched a new archive site for ‘Voices from The Barras’. On the site you can watch additional filmed interviews, edited by Diversity Films alumni, Kim and Tam Hickey. Voices from The Barras – Trailer from Abigail Howkins on Vimeo. 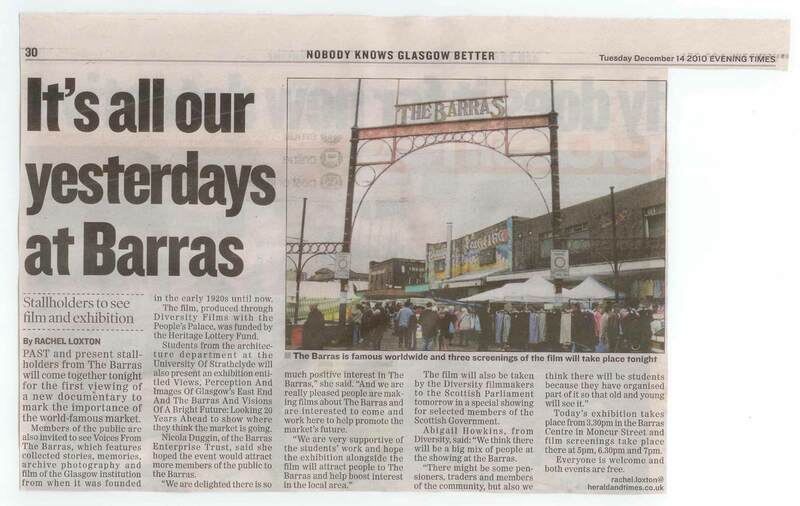 The Barras Story was a community heritage and learning project using archive photography, film and oral history to explore the social, cultural, historical and economic importance of the Barras Market to the East End of Glasgow. Set-up in 1921 by Maggie McIver, the traders and past customers today remember the market’s hey-day, when ‘spielers’ would turn selling into a stage show, shifting their wares as quickly as their razor-sharp patter would allow. People once came from all over Scotland to search for bargains at the Barras. 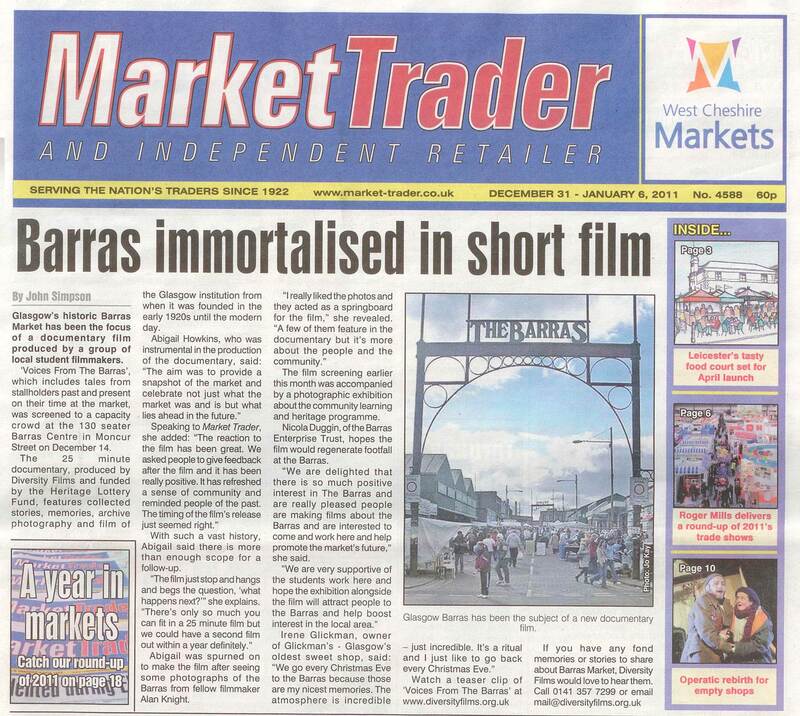 The project focused on collecting Barras community memories and stories, past and present from traders, stallholders, family members and customers. 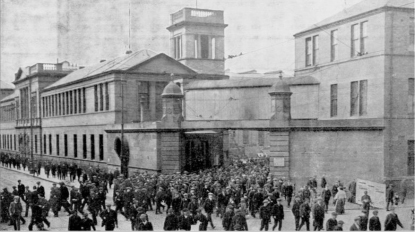 Led by filmmakers, Abigail Howkins and Alan Knight, the project culminated in a 25-minute documentary called ‘Voice of The Barras’ which screened around local venues in the East End of Glasgow, including The Barras itself and project partner The People’s Palace, alongside a presentation of associated archive photos and materials. A documentary celebrating Glasgow’s World Famous Market through archive film, photography and memories of the market characters. The documentary was produced through a community learning and heritage programme run by Diversity Films in partnership with The People’s Palace and funded by the Heritage Lottery Fund. After lying derelict for many a year, renovation of the Fairfields Shipyard drawing offices becan in early 2010. The members of Plantation Productions Senior’s Film Club decided they would like to document the renovation of the building and take a look at its proud past, the people who worked there and the plans for the future of the building. In doing so they uncovered many great personal and historical stories, including recollections of the Upper Clydeside Shipyards “work-in” which, under the stewardship of legendary union leader Jimmy Reid, saved the yard from closure in 1971. 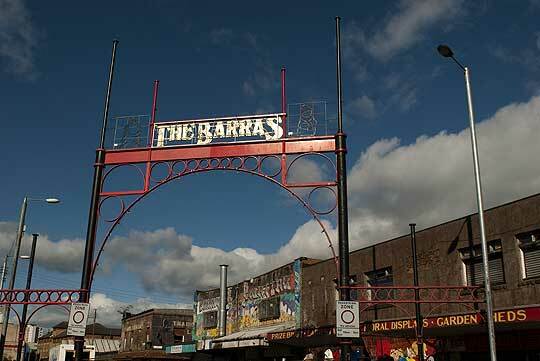 Voices From The Barras will screen at the Old Glasgow Club at its ‘Night at the Movies’ event by special invitation. This member’s screening will take place at Adelaide’s, Bath Street on Thursday 10th February 2011 at 7.30pm. The Old Glasgow Club invites new members to join them in enjoying and perpetuating the history of this great city, sharing and disseminating information worthy of permanent record for future historians. 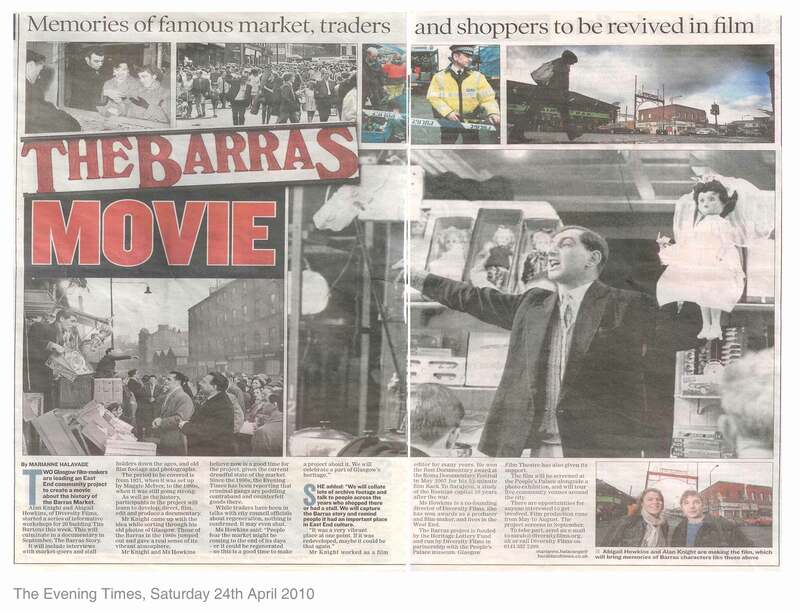 Voices From The Barras is a documentary celebrating Glasgow’s World Famous Market produced through a community learning and heritage programme run by Diversity Films in partnership with The People’s Palace and funded by the Heritage Lottery Fund. The film screening is accompanied by a photographic exhibition about the community learning and heritage programme. 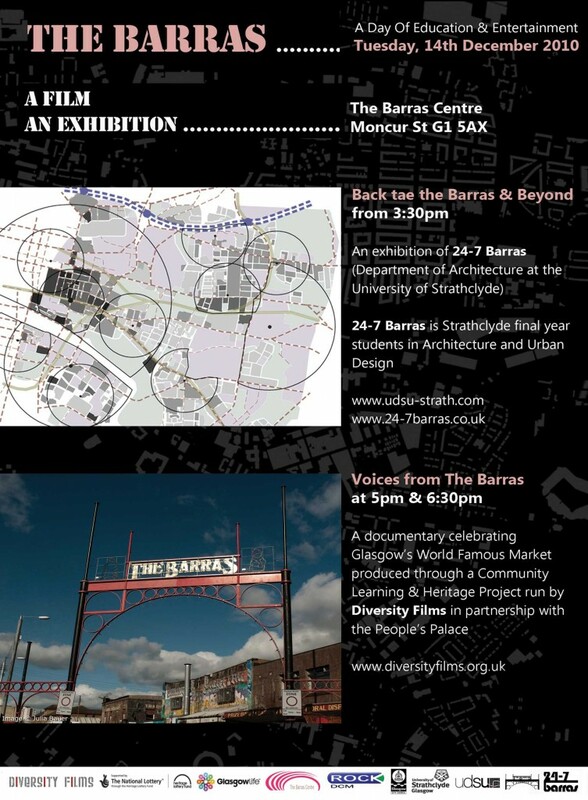 And if that’s not enough, we’ve joined forces with 24–7 Barras (Strathclyde University Urban Design students) who will also be kicking off their Back tae the Barras and Beyond exhibition about the East End at 3.30pm. Supported through the Heritage Lottery Fund, we will be giving away 20 copies of Voices from the Barras free to local community and educational organisations. If you would like to receive one of these copies, please get in touch at mail@diversityfilms.org.uk stating your organisations details. Once our free copies are distributed, individuals and organisations wishing a copy of the film are asked to complete a donation form requesting the DVD and making a donation of your choice to cover costs, post and packaging. Voices From The Barras is a documentary celebrating Glasgow’s World Famous Market produced through a community learning and heritage programme run by Diversity Films in partnership with The People’s Palace and funded by the Heritage Lottery Fund. The film screening is accompanied by a Railing Art photograhic exhibition about the Barras Market at the People’s Palace which will run from Saturday October 23rd to Friday November 5th 2010. The Barras Story project participants worked with a team of professional filmmakers to develop, direct, film, edit and produce ‘Voices of the Barras’.